PSoC stands for “Programmable System on Chip”. With this MCU concept, not only is the ARM MCU programmable, but the analogue and digital peripherals are too. As with an FPGA/CPLD, peripheral elements that require a circuit can be adapted precisely to match requirements. As a result, external components and an associated power supply are not required. This applies both for digital and analogue components. Configuration is extremely easy and performed using a graphic editor in the same way as a circuit diagram. The “PSoC Creator” development environment is provided with all PSoCs free of charge. The PSoC6 has two internal cores that save energy during complex calculations while still producing quick results. 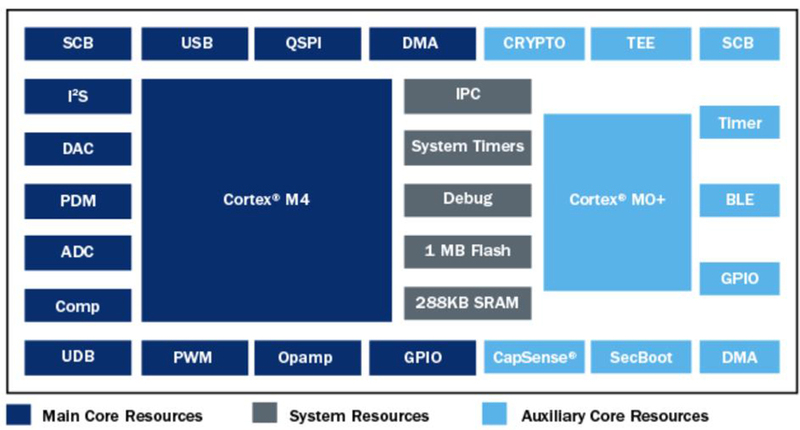 A high-performance Cortex®-M4 core with a floating-point unit and a maximum frequency of 150 MHz is supported by an extremely economical Cortex®-M0+ that can operate at 100 MHz. Individual or dual operation are both possible. During waiting periods, the Cortex®-M0+ remains active to “wake” the Cortex®- M4 when necessary. Both MCUs offer the lowest power consumption per MHz in their class (22 µA/MHz M4, 15 µA/MHz M0+). To enhance IoT security, the PSoC6 is equipped with a high-performance cryptography module and special protection units to prevent unauthorised persons from accessing code or data. Needless to say, this also extends to the external expanded memory, which is connected via a quad SPI bus. 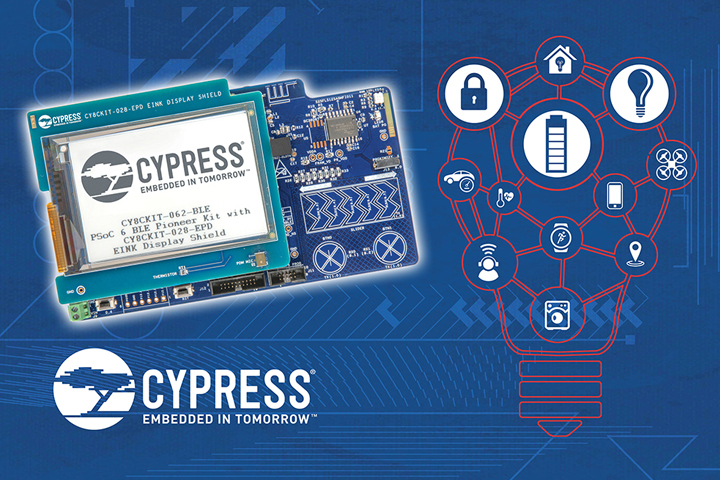 PSoC6 is available in variants with or without integral Bluetooth Low Energy functionality and provides an extremely powerful and secure processor architecture that is ahead of its time in many different respects. PSoC6 is therefore ideal for a large number of applications, ranging from secure IoT communication to energy-saving sensors. 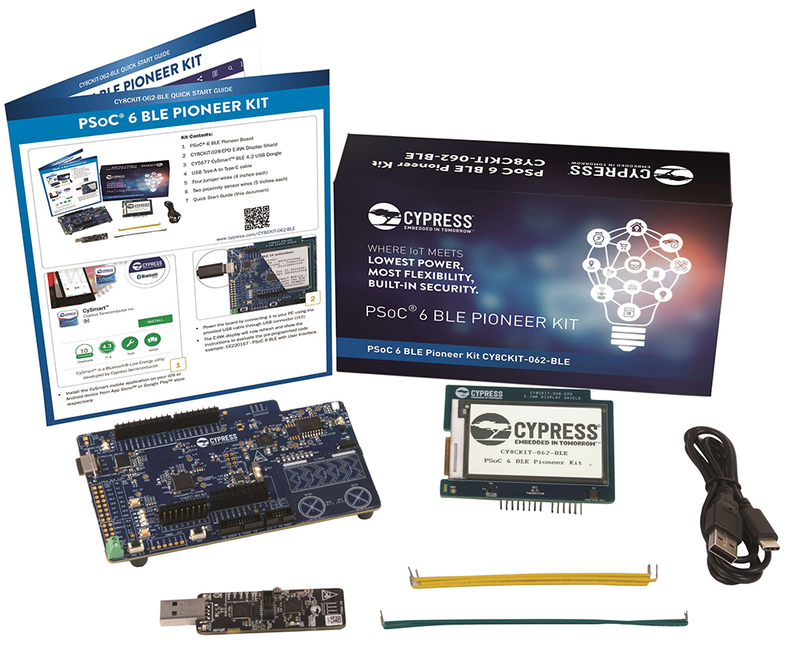 The PSoC6 BLE Pioneer Kit (CY8CKIT-062-BLE) is a solution designed for low-cost development with an integral debugger and BLE. An external QSPI flash, CapSense (for touch sliders and buttons), Arduino shield sockets and a 2.7” E-Ink display offer even more possibilities. A Bluetooth dongle is used to read the BLE protocols. Controllers and starter kits are available from CYPRESS distributor, GLYN.